When a flow enters a duct or confined region, boundary layers immediately begin to grow on the duct walls. An inviscid core accelerates down the duct center, but soon vanishes as the boundary layers meet and fill the duct with viscous flow. Constrained by the duct walls into a no-growth condition, the velocity profile settles into a fully developed shape which is independent of the streamwise coordinate. The pressure drops linearly downstream, balanced by the mean wall-shear stress. This is a classic and simple case of boundary-layer flow which is well documented by both theory and experiment. A classic incompressible boundary-layer flow is a uniform stream at velocity U, moving past a sharp flat plate parallel to the stream. In the Reynolds number range 1 × 103 to 5 × 105, the flow is laminar and orderly, with no superimposed fluctuations. The boundary-layer thickness δ grows monotonically with x, and the shape of the velocity profile is independent of x when normalized. The profiles are said to be similar, and they are called Blasius profiles. The Blasius flat-plate flow results in closed-form algebraic formulas for such parameters as wall-shear stress and boundary-layer thickness as well as for temperature and heat-transfer parameters. These results are useful in estimating viscous effects in flow past thin bodies such as airfoils, turbine blades, and heat-exchanger plates. The flat plate is very distinctive in that it causes no change in outer-stream velocity U. Most body shapes immersed in a stream flow, such as cylinders, airfoils, or ships, induce a variable outer stream U(x) near the surface. If U increases with x, which means that pressure decreases with x, the boundary layer is said to be in a favorable gradient and remains thin and attached to the surface. If, however, velocity falls and pressure rises with x, the pressure gradient is unfavorable or adverse. The low-velocity fluid near the wall is strongly decelerated by the rising pressure, and the wall-shear stress drops off to zero. Downstream of this zero-shear or separation point, there is backflow and the wall shear is upstream. The boundary layer thickens markedly to conserve mass, and the outer stream separates from the body, leaving a broad, low-pressure wake downstream. Flow separation may be predicted by boundary-layer theory, but the theory is not able to estimate the wake properties accurately. In most immersed-body flows, the separation and wake occur on the rear or lee side of the body, with higher pressure and no separation on the front. The body thus experiences a large downstream pressure force called pressure drag. This happens to all blunt bodies such as spheres and cylinders and also to airfoils and turbomachinery blades if their angle of attack with respect to the oncoming stream is too large. The airfoil or blade is said to be stalled, and its performance suffers. All laminar boundary layers, if they grow thick enough and have sufficient velocity, become unstable. Slight disturbances, whether naturally occurring or imposed artificially, tend to grow in amplitude, at least in a certain frequency and wavelength range. The growth begins as a selective group of two-dimensional periodic disturbances, called Tollmien-Schlichting waves, which become three-dimensional and nonlinear downstream and eventually burst into the strong random fluctuations called turbulence. The critical parameter is the Reynolds number. The process of change from laminar to turbulent flow is called transition. The effect of superimposing a wide spectrum of eddies on a viscous flow is to greatly increase mixing and transport of mass, momentum, and heat across the flow. Turbulent boundary layers are thicker than laminar layers and have higher heat transfer and friction. The turbulent mean-velocity profile is rather flat, with a steep gradient at the wall. The edge of the boundary layer is a ragged, fluctuating interface which separates the nonturbulent outer flow from large turbulent eddies in the layer. The thickness of such a layer is defined only in the time mean, and a probe placed in the outer half of the layer would show intermittently turbulent and nonturbulent flow. 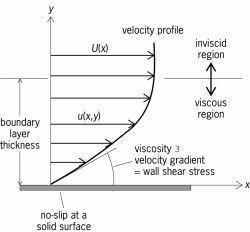 In a flow with supersonic stream velocity, the no-slip condition is still valid, and much of the boundary-layer flow near the wall is at low speed or subsonic. The fluid enters the boundary layer and loses much of its kinetic energy, of which a small part is conducted away although most is converted into thermal energy. Thus the near-wall region of a highly compressible boundary layer is very hot, even if the wall is cold and is drawing heat away. The basic difference between low and high speed is the conversion of kinetic energy into higher temperatures across the entire boundary layer. In a low-speed (incompressible) boundary layer, a cold wall simply means that the wall temperature is less than the free-stream temperature. The heat flow is from high toward lower temperature, that is, into the wall. For a low-speed insulated wall, the boundary-layer temperature is uniform. For a high-speed flow, however, an insulated wall has a high surface temperature because of the viscous dissipation energy exchange in the layer. Except for the added complexity of having to consider fluid pressure, temperature, and density as coupled variables, compressible boundary layers have similar characteristics to their low-speed counterparts. They undergo transition from laminar to turbulent flow but typically at somewhat higher Reynolds numbers. Compressible layers tend to be somewhat thicker than incompressible boundary layers, with proportionally smaller wall-shear stresses. They tend to resist flow separation slightly better than incompressible flows. The flow of that portion of a viscous fluid which is in the neighborhood of a body in contact with the fluid and in motion relative to the fluid. The steady laminar magnetohydrodynamic (MHD) boundary-layer flow past a wedge with constant surface heat flux immersed in an incompressible micropolar fluid in the presence of a variable magnetic field is investigated by Ishak et al. Pop, "Mixed convection boundary-layer flow near the stagnation point on a vertical surface in a porous medium: brinkman model with slip," Transport in Porous Media, vol. In this investigation, the analytical approach called Homotopy Analysis Method (HAM) has been successfully applied to find the most accurate analytical solution for the velocity distributions of a steady two dimensional boundary-layer flow of nanofluids on a flat plate. Makinde, "On MHD boundary-layer flow and mass transfer past a vertical plate in a porous medium with constant heat flux," International Journal of Numerical Methods for Heat and Fluid Flow, vol. The topics include comparing the performance of copper oxide nanofluid with water in electronic cooling, preparing and characterizing surfactant-coated cerium-zirconium nanoparticles and nanofuel, the boundary-layer flow of a nanofluid past a stretching sheet under uniform heat and mass flux, the effect of adding aluminum nanoparticles on the cooling performance and quench severity of water during immersion quenching, and using ultrasound thermometry to study natural convection in opaque nanofluids. Mixed Convection boundary-layer flow over a Vertical surface embedded in a porous medium: European Journal of Mechanics B/Fluids, 22, 529-543, (2003). Watanabe  investigated thermal boundary-layer flow over a uniform surface temperature wedge with a transpiration velocity in forced flow. of Memphis) presents thirteen chapters covering fundamental concepts, fluid statics, base equations of fluid mechanics, dimensional analysis and dynamical similitude, flow in closed conduits, flow over immersed bodies, flow in open channels, compressible flow, turbomachinery, measurements in fluid mechanics, the Navier-Stokes equations, inviscid flow, and boundary-layer flow. Experiments were conducted in a simple flow tank to assess the response of settling cyphonautes larvae to shear flow and their behavior in different boundary-layer flow conditions. Yazbak explains that information provided by flush-mounted thermocouples near equipment walls doesn't really represent the temperature of the rest of the melt steam due to boundary-layer flow effects and the fact that polymers are poor thermal conductors. Boundary-layer flow problem over a moving or fixed flat plate is a classical problem, which has been investigated by many researchers, for example Bachok et al. Mixed convection boundary-layer flow along a vertical surface in a porous medium, Num.